On Thursday, October 22, 2015, a call was received by a call-taker at the Pinellas County Regional 911 Center. There was a report of a vehicle entering a body of water at the Lake Haven Mobile Home Park which is at 1415 Main Street in Dunedin. Units were dispatched from Dunedin Fire Rescue and many other surrounding agencies to assist. The car was presumed to be occupied as no occupants were seen exiting the vehicle. East Lake Fire Rescue responded with their Water Extrication Team (WET) which launched in May 2015. Their specialized equipment allows the trained rescuer to be geared up in under 20 seconds. They state their goal is to rescue not to recover. Multiple divers from various agencies were able to locate the vehicle that was more than 120 feet from the shoreline and confirm no occupants were inside. According to bystander, Tyler Sontag, he was told the owners were at the clubhouse exercising when the car entered the water. They were alerts by neighbors at the Lake Haven Community. Deputies reported that the vehicle was left in neutral causing the vehicle to begin rolling toward the water. Divers went through a decontamination process as they exited the water. A couple of the rescuers were treated for minor injuries that occurred during the operation. 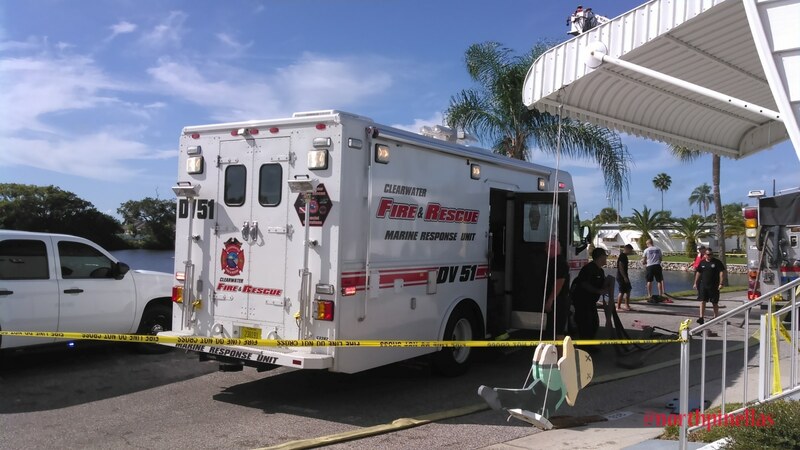 The operation was turned over to the Pinellas County Sheriff’s Office once it was confirmed the vehicle was unoccupied.